There is a need to unite against the crimes, said the Asstt. 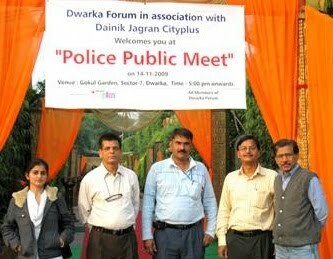 Commissioner of Police, M. S. Randhawa, while replying to the queries in the Police-Public meeting organized by the Dwarka Forum at Gokul Garden, Sector-7, Dwarka, in which Dainik Jagran City plus was the media partner. 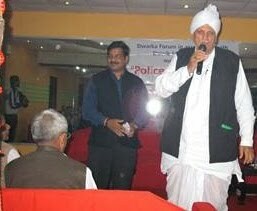 Mr. Randhawa said that police analyze the reasons for crime in Dwarka to find out permanent s olution. Welcoming the initiative taken by the Forum and replying to the issues raised by the residents, he informed that 85 to 90% cars are stolen from the market and stressed the need for installing the anti-theft devises which has only one time expenditure. He is also open to the system contract parking which will solve the problem of theft and traffic jam due to the parking the vehicle in a haphazard manner. Mr. Randhawa said that public should identify the Bangladeshis residing illegally and the police can also reward public for such an initiative. Police is facing the shortage of manpower as 22 new police stations has started fun ctioning but to overcome this, fresh recruitment process will start soon but it finalisation may take up to two years. He also said that the incident of chain snatching have decreased as the police has provided 8 motor-cycles to its staff for patrolling and police has caught many gangs involved in snatching. Police sometimes puts the decoy also to nab the snatchers. On the complaint of the participants against the open drinking, he said that the police has arrested about 1400 drinkers for open drinking and creating nuisance under the DP Act. This problem is acute in sector 23 and he will take necessary steps to stop this. On burglary, he stressed the need for the close interactions among the residents of the Societies and DDA pockets and neighbour watch hood scheme. He also said that the police is considering to take step for the verification of agencies providing guards and can also issue grading of these agencies. He advised the management of the societies to prevail open such agencies for providing only such guards who have been verified by the police. He also suggested that the public can also verify the residential address themselves by sending a money order of small amount at the residence of the worker and if that is taken by some one, it will confirm the correctness of the address. Apart from this, the Managements of the Societies and employers should also insist for the verification of workers working inside the societies and DDA pockets. He informed that in the past, there were over 40 weekly bazaars, which have now been brought down to 6 only. Other problems discussed were encroachment particularly by food vans and encroachment by shopkeepers in front of their shops and said that if the resident spot any policeman taking bribe for ignoring the encroachment, he can inform him on his mobile also. He informed that he has suspended a head constable on the suspicion of taking bribe and said that he is determined to break the nexus between some shopkeepers and encroachers despite the problem of multiple agencies. He will that the Delhi police is giving training to its staff to behave in proper manner with the public, to be in proper uniform and in disciplined manner. Many other problems of the residents were discussed. He assured the Public that the police pickets would be increased and efforts will be made to verify all the security guards. 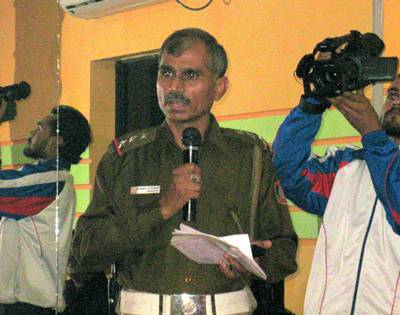 Traffic Inspector, Bishwajit has also replied the queries of the participants on the traffic management in Dwarka. He said that the traffic violators shall be booked and the Traffic Police has approved the installation 18 new traffic lights on different intersections in Dwarka. The meeting was hel d on Saturday (14.11.2009) and was attended by the Asstt. Commissioner of Police, M.S. Randhawa, SHO, Dwarka (N), Bhagwan Singh, Traffic Inspector, Bishwajit, office bearers and members of Dwarka Forum, Office bearers of RWA/CGHS, Sh. S. P. Rai – President of Senior Citizen Association, Dwarka, Sh. Kishan Chand – Pradhan of 360 villages, Sh. Rajeev Solanki – Gokul Garden, Ms. Pooja Sethi of Jagran Group, Sh. Naresh Lamba – President of Social Development Welfare Society, Sh. Surat Karan – President of Saksham NGO, Representatives of Social Welfare NGOs, Members of Dwarka Parichay, prominent citizens and residents. प्रभु आओ , प्रभु आओ, रामकृष्ण प्रभु आओ….